A study by the UK’s University of Oxford has found that about 10 million pesos was spent to hire online trolls to spread propaganda for President Duterte and target his opponents. 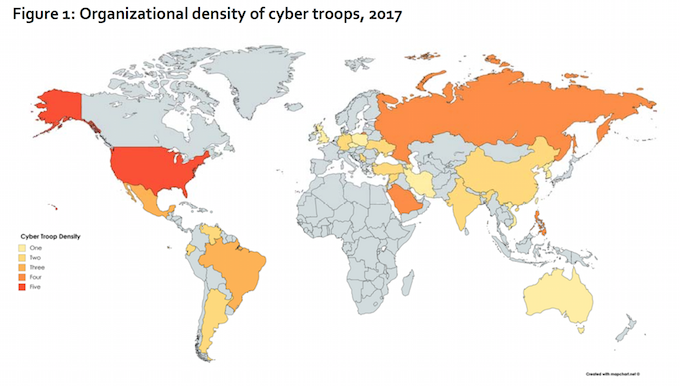 The study entitled Troops, trolls and troublemakers: A global inventory of organized social media manipulation examines how political parties and candidates in 28 countries deploy “cyber troops” to shape public opinion. The countries examined in the research were Argentina, Azerbaijan, Australia, Bahrain, Brazil, China, the Czech Republic, Ecuador, Germany, India, Iran, Israel, Mexico, North Korea, the Philippines, Poland, Russia, Saudi Arabia, Serbia, South Korea, Syria, Taiwan, Turkey, Ukraine, the UK, the USA, Venezuela and Vietnam. The study said that Duterte’s team of up to 500 trolls posted “nationalistic and pro-government” comments and targeted dissenters for “harassment” involving “verbal abuse, hate speech, discrimination and/or trolling against the values, beliefs or identity of a user or a group of users online”. Fake accounts, including “bots”, were also shown to have been deployed. These were used to flood social media sites with “spam and fake news” and inflate the number of likes, shares and retweets to create “an artificial sense of popularity, momentum or relevance”. The report said: “This is different to traditional digital campaign strategies, which have generally focused on spreading information about the party or candidate’s platform, or sent advertisements out to voters. The study alleges that “keyboard trolls” were hired in the run-up to the presidential election last year. Officials of the president’s PDP-Laban party have denied the allegations, saying they were “plain and simple ignorant”. The Oxford University study was conducted in three stages. First, through a systematic content analysis of news media articles. The researchers then supplemented the content analysis with other sources from think tanks, government agencies, civil society groups, universities and other credible research. Finally, they consulted with country experts to check facts, find additional sources in multiple languages and assist in evaluating the quality of sources. What a vague study that doesn’t even identify who within Oxford did the study. This so called “study” appeared to have been based on claims by Filipino self-described experts on social media but are actually part of the well-funded establishment opposition. There was no solid evidence of anyone funding anything. On the contrary, during the election, the “yellow” establishment candidate so well-funded, they even spent 20 million pesos on last minute TV attack ad to discredit Duterte. This report is mere propaganda. Sorry Randy, the report’s authors are identified, they are Samantha Bradshaw and Philip K Howard. Do you really think they studied 28 different countries, solely to discredit the Duterte administration? It seems unlikely to me. Martin, they were paid by Trillanes and Delima’s Army. Do your homework. Wow, must have deep pockets to fund extensive research into 28 countries. who uses fake social media account? what a research! did they dig up the names of those “bot” accounts? duterte followers seldom uses fake names unlike your ally here who hides in their mother’s skirt! and don’t under estimate the power of drug money to finance such useless research! I am happy that we have him as a president. What is more better than his sencirity to change things in our country? Imagine if the previous administration still rule in power, maybe we are still all Complain and negative impressions like for the past few decades. After years of increasing freedom, is Southeast Asia now going backwards?